US roofing distributors' sales are forecast to rise 5.4% per year to $20 billion in 2021. The residential market, which amounted to the larger share of roofing distributors' sales, will register rapid sales growth through 2021. The South region of the US experienced a variety of severe weather events in 2016, causing widespread roofing damage. Many expect further severe weather outbreaks will assist future distributors' sales. 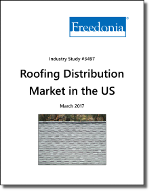 This study analyzes the US roofing distribution market, presenting historical data and forecasts for 2021 by sales channel, market, and product type. Sales of roofing are discussed at the subregional level, with further analysis provided for state markets. The leading roofing distributors in each subregion and state are also discussed including ABC Supply, Allied Building Products, Beacon Roofing Supply, GulfEagle Supply Home Depot, Lowe’s, and SRS Distribution.